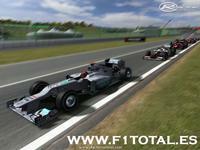 F1 Total, with the invaluable assistance of GTEMOCION presents the new MOD F1 TOTAL 2012, the first MOD for rFactor calibrated by Real Drivers. 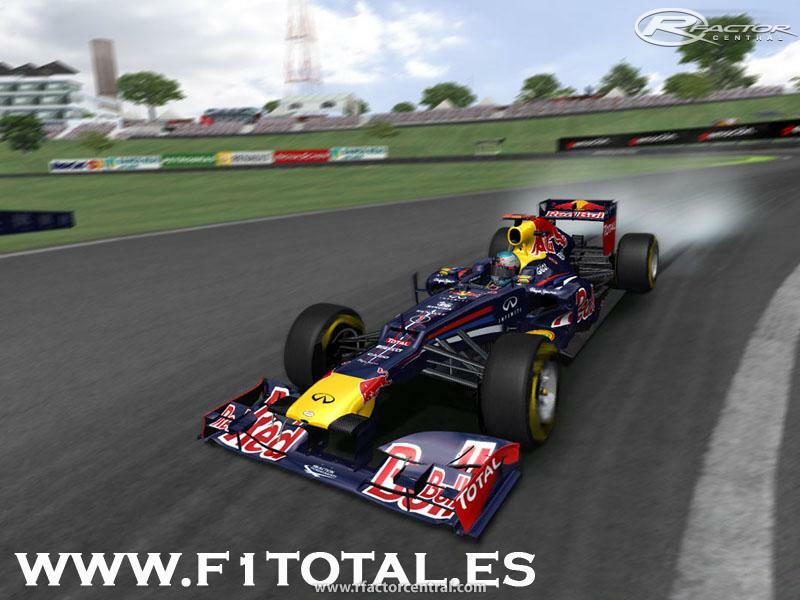 In this Lite Version only find a car and a circuit, register at http://www.f1total.es/en/ and you can download the full version of F1 TOTAL 2012 free. This mod is an update for rFactor v1.255. The program is fully compatible with Windows7. 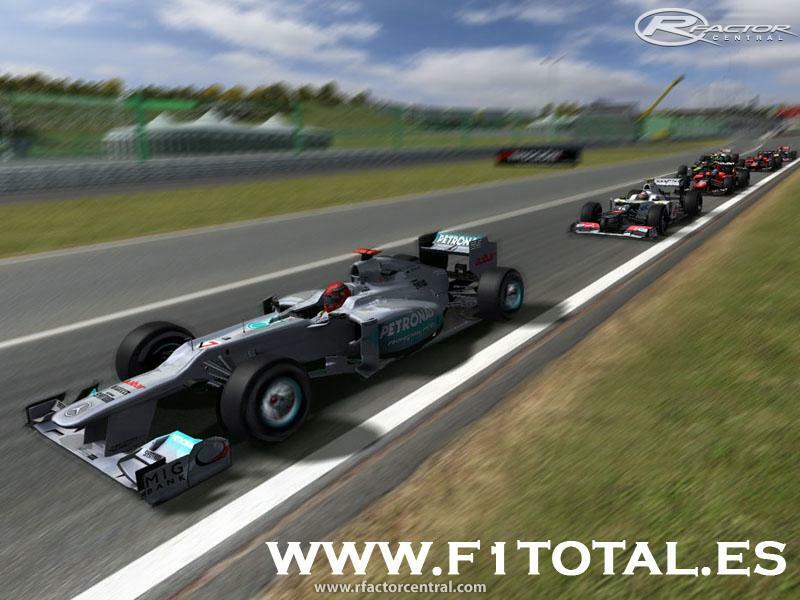 This is the only mod for rFactor Formula 1 that meets the FIA regulations, and physics are limited to data provided by different real Drivers, related to the competition during the 2012 season, so the car behavior is unlike other MOD's, this is REAL. The mod features a control panel (F1 Total Control Panel.exe) for general configuration and installation of plugins. The rfDynHUD plugin is not installed by default, you should install it from the Control Panel (F1 Total Control Panel.exe). This is a mod designed to drive from the camera of the Cockpit, I encourage you all to try. - New models of cars in September 2012. - Rear wing mobile for use in conjunction with the DRS plugin or rFHighVoltage. The instructions of use are included in the Control Panel (F1 Total Control Panel.exe). - Plugin actual effect of KERS and DRS from F1RFT adapted to F1 TOTAL with the permission of the creator of the plugin. - Installation of rF_HighVoltage 1.4.1.1 plugin included in the Control Panel (F1 Total Control Panel.exe). - Three engine maps for use only with the option rFHighVoltage. The most aggressive comes installed by default, the other two reducing the consumption and the power as in real racing, not the rpms like in other MODs. - The physical perimeter of collision expanded to the wheels of the car. - New real damage.ini deformation effects. For its correct use you must configure the percentage of damage to the 50 %. - New wheels adapted to the current rules of Formula 1 for 2012, using tires width 245/660R13 front and 325/660R13 rear, thus varying the radius of the same to 330.0mm front and 330.0mm rear. Likewise tires we have adapted to the actual data in the 2012 season in parameters of wear, pressure, temperature, grip and performance. - New gearbox with 3 final drives, the first thought for urban circuits and the other 2 to adapt to the different circuits of the championship. - Fully operational safety car to be drivable for real commissioners in On Line Leagues. As option in upgrades section, the Safety Car can have a Sport GT kit installed. - New sound more real for the Safety Car. - Installation of the plugin rfDynHUD included in the Control Panel (F1 Total Control Panel.exe). - Installation of the plugin for Logitech G27 steering wheel LEDs included in the Control Panel (F1 Total Control Panel.exe). - Menu Selection, menu Traditional or Professional XUI 1.8 included in the Panel Control (F1 Total Control Panel.exe). - Installation of the Real Feel Plugin included in the Control Panel. It should be installed from the Control Panel (F1 Total Control Panel.exe) and then from upgrades of the car in "Steering Wheel" menu. - MOD fully translated. 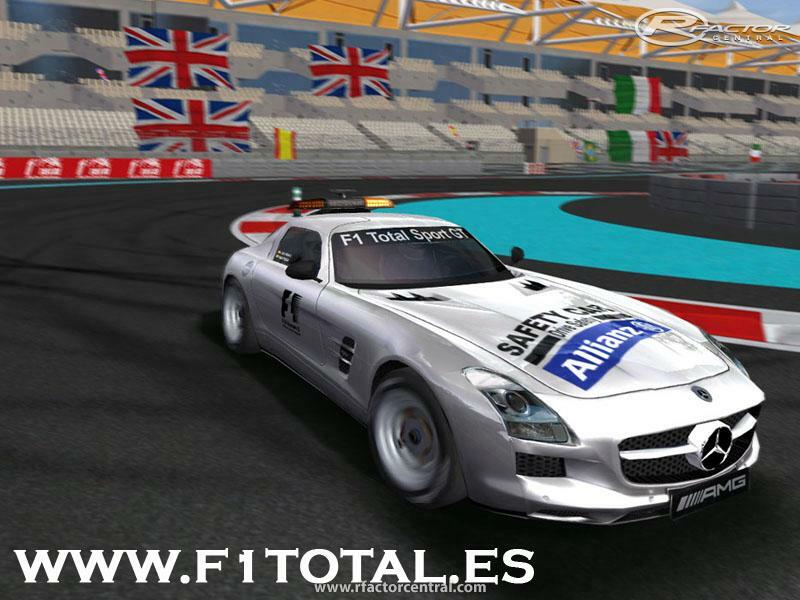 Four languages are available: F1TOTAL-Spanish, F1TOTAL-English and F1TOTAL-French and F1TOTAL-Portuguese. - Rearview mirrors in the cockpit with four options selectable from improvements to the car: Near, Far, Real or Off. - New files .ini exclusive for F1 Total in Comments folder to silence the engineer without touching the file CommentaryEnglish-USA.ini original. - Brightness in the sides of the tires and design updating with four models GMT. times. Something unthinkable until now because the variation was set at 0.2%. To manage this parameter from the steering wheel comfortably will facilitate overtaking. 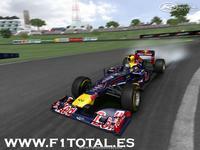 - New improved F1Total Physics calibrated to the limit. - New designs of all the cars with many new features and general tweaking such as cameras, mirrors, light rain, and general plate and paint. - Parc Ferme. A new feature ParcFerme is installed by default, ie we will have to use a single set-up for qualification and race. It Works as follows: When you go to the qualifying session, you can load adjustment, edit, modify etc, but when but when you go to the track the first time, the adjustment will be freezed and you are no longer allowed to change anything but fuel and the tires. The creator of a session may cancel or change it, setting in his PLR the option Multi ParcFerme = "3"
- New Pirelli tires. Four types of tires to choose according to the race from improvements to the car. The four types of tires are differentiated by color according to the following scheme: Gray = Hard, White = Medium, Yellow = Soft, Red = supersoft. - Reduced by half the negative impact the radiator opening has on the aerodynamics of the car. - System of engine wear. Three engines to choose according to the races. The default engine is the known 770ps whose speed of heating we have toned down, the second engine has a loss of effectiveness of 2.5% and it heats a bit more. The third engine has a loss of effectiveness of 5% and it heats at the same rate as that of 2010. The idea on its use is the one proposed by MaxRufus, i.e. using 4 engines for the whole season (10 races) and each pilot manage them freely according to the Grand Prix disputed. -Wear System Gearbox 5-level with the same system of use. -Mechanics (4s, 8s, 16s). I have kept them in case any league uses. -Standard Weight of 640Kg with or without K.E.R.S. -Reduction of the weight distribution of fork rates to 45.5% - 46.7% front and 53.3% - 54.5% back, according to the rules 2012. There are currently no setups for F1 TOTAL 2012. Add a Setup. why do i get a msg that says trojan removed? U have to be registered to can download. Its free and safe. After registration the F1Total sent to you na email confirm to activation your account. Access that link and after that you will able to download all the stuff.. One advice their trackpack isn t bad but exists better with for exemple the IMT F1 2012 and the WCP F1 2012 tracks. i tried to log in to the F1Total website and download the wireframes for the cars and the full trackpack but i keep getting a message that "i'm not allowed to access the private area of the website", so how the hell do i download stuff. Would be nice if templates were provided by the makers so others can paint their own cars and pit crews. I have searched these pages and the mod makers forum and did not see any mention of them Anyone have a link to some? Hi mate plwase tell me whats your rfactor version? Legacy or downloaded? Its 1255 c? This is how I got this mod to work(only tried it off line) and this is for the full version that you download from there web page http://www.f1total.es/en/ but install should be the same. 1-Run all the installs in Administrator mode the f1 Total 2012, track packs, RFE addon and HD Wheel. 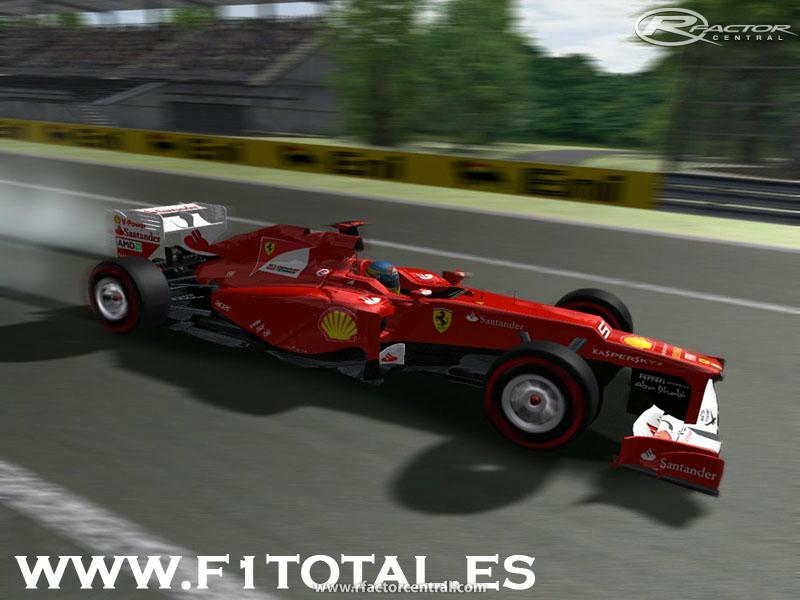 2-install f1 Total 2012 to your rFactor directory, when you install it for the first time it will automatically create a folder named F1 TOAL 2012, delete this and install it directly to the rfactor folder. 4-(optional)install the RFE addon and the HD Wheel to your rFactor directory, do not install it to the automatically crated folder! 5-Run F1 Total control panel and install the desired plugins(KERS DRS or Highvoltage, HD Wheels, RFE, etc...). make shure to install Java and C++ for KERS and Microsoft Frameworks for Highvoltage that come included with the control panel application. Now comes the key bindings for the KERS and DRS. 1-(if runing KERS DRS Track plugin skip this part)Run rF_HighVoltage in administrator mode located in rFactor\rF_HighVoltage directory. Go to Options\Keyboard/Joystick. select your input devices in the drop down tabs and assign the buttons. Do not forget to assign DRS Deactivate to your brake pedal. 2-Run rfdynhud_editor_launcher in administrator mode located in rFactor\Plugins\rfDynHud\editor directory. Go to Tools\Edit Input bindings, for DRS Action select the same button for DRS activation used in rF_HighVoltage. For TempBoost select the button for KERS activation used in rF_HighVoltage. Go to File and Save. 3-In rFactor, go to controls and were it says Temporary Boost bind that to the button for KERS, then go to handbrake and bind that to Activate DRS button. And your done!!! Hope this helps and if i miss anything feel free to edit this.